Hotel The Buah Bali Villas is located in very convenient location near Oberoi Street where many attracting popularity spots. Villa of all 6 used thatched roofs and marble and natural material, furniture of the wisteria are the interior with Bali atmosphere. You can stay there for a feeling as staying in your own house in the settled down atmosphere. I think that it`s good, the villa built in interesting design. 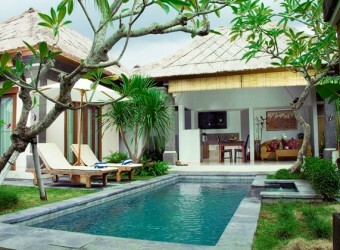 I and my girlfriend like this hotel villa!! It was good that the swimming pool also gives privacy. Welcome fruits served in Balinese style! Breakfast was included, and we also had a romantic candlelight dinner. We want to stay at this hotel villa again.